An excellent read, by Cédric Blancher of EADS (in French sorry, automated translation to English here). All I can say is: remember the "I'm not saying there should be a capital punishment for stupidity, but why don't we just take the safety labels off of everything and let the problem solve itself?" joke? Yeah, the victims won't be the security people. For new readers, this is the follow-up to a first part entitled "Internet By All Means" in which I was describing how to maximize your chances to get a full & secure Internet access almost anywhere. In order to achieve this goal we had to achieve maximum reachability on the Internet for various networking services and thus, maximum exposure to remote attacks... making this an interesting case study for discussing the implementation of a maximum of security measures. First of all, let's assume that at least one of these networking service WILL get hacked. What do we have at stake? What mustn't the hacker be able to do from there? The first two issues can simply be addressed by a common best practice: run the stepping stone on a dedicated (virtual) machine and isolate it from the rest of the network by placing it inside a DMZ. This is an easy way to physically contain an intrusion, but not sufficient as we still want to avoid it. Many network services require privileges so that they can for example bind to a port under 1024 or create virtual network interfaces. The thing is: they usually need these privileges only during startup, so why have them still available afterwards? A hacker could find profit in that, especially since full (root) privileges are often given to such services instead of just a selection of the privileges they require. Therefore, these network services must be made to drop their privileges as soon as possible. Problem is: since only they know when it becomes indeed possible, this security feature has to be built in each of them. Fortunately, most of them already have it (see the "-u" flag in Iodine, "user" and "group" options in OpenVPN, etc) and when they don't, the beauty of open source software is that you can add the feature yourself like I did for PingTunnel. With a complex filesystem tree you can never be so sure as to have all the file access rights covered: with incorrect read access control on a pseudo terminal device for example a hacker could manage to perform keylogging, and with incorrect write access control in some place or the setuid-bit set on the wrong binary a hacker could perform a privilege escalation. But thanks to filesystem isolation security features available in modern operating systems, it is possible to convince a program that the filesystem tree starts in a directory of your choice; that way, you can simply forbid any file operation to a process by just "chroot'ing" it in an empty directory with no write permission. Many sysadmins and even security engineers stop at step #4, if not less... It's a huge mistake! Why? Because of kernel exploits: if a hacker can make one of your processes perform a vulnerable system call, he can obtain kernel privileges (the highest privileges possible) and all of a sudden it's game over! So, in order to prevent that from happening, we want to forbid each process from performing system calls it does not need. Since kernel exploits are usually found in lesser used system calls like vmsplice, and since the stepping stone related processes once initialized will need little more than network I/O related system calls which can now be considered hardened, we can safely assume that with this technique we zero out the likelyhood of this scenario. As it is often the case in the UNIX world, there are many alternatives for that: Security-Enhanced Linux (SELinux), GRSecurity, RSBAC, AppArmor, the Linux Intrusion Detection System (LIDS), etc... each having its own advantages and disadvantages. Personally I use SELinux, probably the most cumbersome one but the most production-ready one in my opinion. Yes, NSA SELinux... If you think I'm crazy for recommending software from a spy agency, I've got a question for you: which one is the most endangering, a closed-source operating system like Windows or a completely open source Linux Security Module? Most SELinux policies (like the ones found in the Reference Policy project) are applied on programs at the moment they are launched, which makes for over-complicated and coarse-grained policies. The one for OpenVPN for example deals with far much more than just network I/O: notably it deals with (and permanently allows) modifying network interface properties and routing table, something OpenVPN only needs to do at startup; this adds for one unnecessary complexity, but also, importantly, insecurity as letting a hacker play with your routing table is definitely not something you want to do. As explained above in the paragraph on relinquishing privileges, it often makes much more sense to have each software apply security policies to itself as only it knows the best moment for that is. Therefore I added SELinux support to Iodine, PingTunnel and both 2.0 & 2.1 branches of OpenVPN. In the case of HttpTunnel it is not necessary as it needs only network I/O from the start. At this point, a successful hacker should only be able to use the networking capabilities of your stepping stone, which is far better than average but still: we don't want anyone to be able to use our stepping stone as a relay for hacking or illegal downloading (especially with the new Internet access suspending laws like HADOPI in France), do we? But if you consider your tunneling software compromised, how do you differentiate between legitimate traffic (the traffic that was tunneled) and illegitimate traffic (traffic generated by the hacker inside the compromised tunneling software)? For that you need to authenticate the legitimate traffic, and this is exactly what IPsec's Authentication Headers are for. Note that even though IEEE 802.1X is a network authentication mechanism too, it won't do here as basically once a network cable is authenticated it allows whatever traffic coming through it. As you can see, the stepping stone is separated from the rest of the LAN by being both a DMZ (in the proper sense of the term) and a DMZ host in order to receive all traffic from the Internet (except for the NAT-related one in my case since it belongs to other computers in my home network). Speaking of my home network, for the sake of clarity I put nothing more than an icon, but for the ones willing to play Catch 22, I have two words: Intrusion Detection. Now, since what's underneath whatever encapsulation we used to reach the stepping stone by all means is actually IPsec traffic, providing us with authentication and encryption capabilities, we can have a completely compromized stepping stone that is neither able to send any other traffic than the one it is meant to forward nor able to sniff said traffic. People suggested that I use port knocking which is a nifty idea in general, but not possible in our case as we won't always have a direct connection to our stepping stone: it is likely that we'll have to route our DNS tunneling through other servers, our HTTP(S) tunneling through proxies, etc. However, when you want to use your stepping stone you are most likely to have a second means of telecommunications at your disposal: the phone! Combining it with the firewall allows us to solve the problem, by performing something that I like to call two-factor Network Access Control. Personally my landline phone service includes a free SIP (VoIP) account, which makes it very easy to trigger a script on the firewall by just making the phone ring: no need to have the script pick up, that way it costs absolutely nothing even when calling from abroad! Here's an example of such a script. 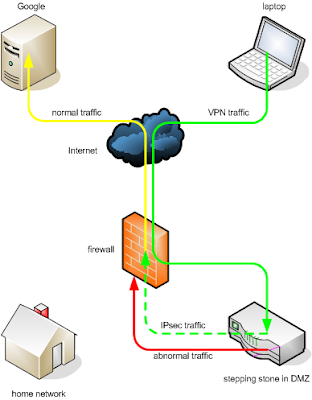 The idea is to allow traffic to the stepping stone only from a selection of trusted Internet sources (wherever you successfully used it from), and every time you move to a new place, just make the phone ring to lower the firewall for a short period of time, have it learn from where you are connecting, and raise again. For example, let's say you're a student living on-campus; the university provides you with broadband Internet access via Wi-Fi, which is great, except for the fact that you cannot trust it (yes, even when you're careful to use HTTPS and so on, I'll cover that in subsequent blog posts). A general solution to that problem would be getting your very own private Internet access, but being a student, you would prefer not to waste too much money into it, so you'll most likely take the cheapest subscription. So now you have two routes to the Internet: a fast but insecure one, and another that is private but slow. How to use both on the same computer? As bandwidth-intensive applications are often also the ones that don't really require privacy, one could imagine categorizing programs in a way so as to watch Internet TV over the Wi-Fi network while corresponding over the cable. Step 1 is of course required only once; steps 2, 3 and 4 are better put together in a shell script. Regarding step 5, it is much more practical to edit your KDE menu entries for example and there specify that the program has to be run as the wifi user. One last remark: know your localhost network architecture, some of the wifi user's traffic might still go via the default route! This will be the case if, for example, you use a local DNS cache such as NSCD or any other kind of local proxying (Privoxy, Tor, etc). crack them, and as most of you probably know, dictionary attack is the simplest yet formidable technique for cracking passwords. Now, the problem is: your dictionary has to be as exhaustive as possible. Relying solely on common dictionaries (such as The Collins, Le Larousse, the ones contained in spell checkers, etc) just won't do because these are very limited, whereas basic human nature has us looking around when prompted to choose a password; a lot of people will then choose "belinea" because it's the brand of the monitor sitting in front of their eyes, "abnamro" because it's the bank outside their window, and so on. However, it is very likely that any word you can put your eyes on is already in Wikipedia: try it, it is amazing. A couple of years ago I generated a quick & dirty wordlist from Wikipedia in a dozen of languages. It helped quickly crack countless passwords, a lot of which bruteforcing would never get to. sure JohnTheRipper's derivation algorithms will uppercase letters here and there, but it might miss passwords like "hawKeye" or "amaroK"
Many thanks to Tyop , sbz, s0kket and Sorcier_FXK! Also, for those wondering: there are 58427178 words in the wordlist, and it weighs 213MB (710MB uncompressed). Killing time in the metro by listening to podcasts of past security conferences, I got the idea of using DNS caches to check IP-spoofing capability. So, if you issue an improbable query (for example 0.577493021235...325521009964.ws which will resolve correctly because .ws uses wildcard records) to a DNS caching server while faking the source IP address, and then issue the very same query from your real IP address a couple of seconds after, the reply to the latter will tell if the DNS server received the former. The only problem is making sure no network equipment enforced a real source IP address on the packets... Some ISPs might simply rewrite the source IP address (instead of just dropping the packet, which most of them do) : this is easy to detect because you would get replies to both the "fake" and real queries. NAT routers are more annoying: mine accepts the fake public IP address as source to the packets, stores it in its table, forwards the packets with its real IP address, and when the replies arrive... doesn't know whom to send the packets to, other than to the DMZ (which is noticeable because it starts sending ARP requests for it)... Stupid, stupid NAT router!